Rooting powder will speed up the root development of stem tip cuttings. 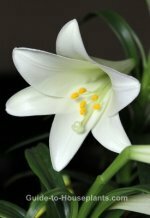 Many house plants are propagated this way -- and fortunately, it's easy to do. Pour a small amount of the powder in a shallow container or onto a piece of paper. You want to avoid contaminating the bottle of hormone powder by dipping your plant directly into it. To take a cutting, use sharp, sterile pruners or a razor blade to cut a 3-4 inch (7.5-10 cm) stem with at least one leaf. Cut just below a leaf node (the place where a leaf is attached to the stem). Nodes contain cells that will grow roots. Dip the cut end in hormone rooting powder. Insert the cutting into moist rooting medium, burying about two-thirds of the stem. Firm the medium gently around it. Place the pot in a warm location (about 70°F/21°C) in indirect light. Keep the medium just barely moist. Hormone rooting powder is usually available in garden centers. Bontone rooting powder, shown here, promotes development of roots from cuttings. 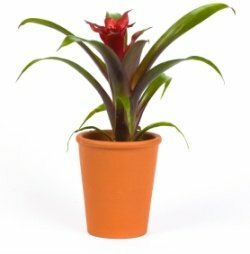 It is ideal for soft cuttings (plants with soft, fleshy stems), which includes most house plants.